A major storm or hurricane hits your area and on the radio you hear reference to a "100-year flood". But what exactly is a "100-year flood"? The term "100-year flood" is often used to describe a flood of great magnitude, but there is a lot more to it. Flooding and high water are of major interest not only here at the U.S. Geological Survey (USGS), but to most of the population of the United States. 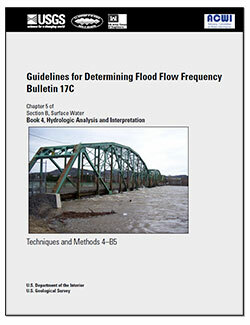 The USGS conducts research on the physical and statistical characteristics of flooding, estimating the probability of flooding at locations around the United States and attempting to understand how the frequency of flooding changes with urbanization, climate variability, and other factors The term "100-year flood" is often used to describe a flood of great magnitude .... but what exactly is a "100-year flood"? Robert Holmes, USGS's National Flood Program Coordinator, offers up the following explanation of the 100-year flood that we can all understand. You can see Robert's full poster explaining the concept of the 100-year flood at http://pubs.usgs.gov/gip/106/. A flood is any relatively high streamflow overtopping the natural or artificial banks in any reach of a stream. Floods occur for many reasons, such as long-lasting rainfall over a broad area, locally intense thunderstorm- generated rainfall, or rapid melting of a large snow pack with or without accompanying rainfall. Because floods result from many different circumstances, not all floods are equal in magnitude, duration, or effect. Placing floods in context allows society to address such issues as the risk to life and property, and to study and understand the environmental benefits of floods. Trying to place contextual framework around floods is where such terms as "100-year flood" came into being. So what is a 100-year flood and how is it determined? Large-scale flooding was occurring in December 2015. Likely lots of "100-year flooding" was happening. In the 1960's, the United States government decided to use the 1-percent annual exceedance probability (AEP) flood as the basis for the National Flood Insurance Program. The 1-percent AEP flood was thought to be a fair balance between protecting the public and overly stringent regulation. Because the 1-percent AEP flood has a 1 in 100 chance of being equaled or exceeded in any 1 year, and it has an average recurrence interval of 100 years, it often is referred to as the "100-year flood". Scientists and engineers frequently use statistical probability (chance) to put a context to floods and their occurrence. If the probability of a particular flood magnitude being equaled or exceeded is known, then risk can be assessed. To determine these probabilities all the annual peak streamflow values measured at a streamgage are examined. A streamgage is a location on a river where the height of the water and the quantity of flow (streamflow) are recorded. The U.S. Geological Survey (USGS) operates more than 7,500 streamgages nationwide (see map) that allow for assessment of the probability of floods. Examining all the annual peak streamflow values that occurred at a streamgage with time allows us to estimate the AEP for various flood magnitudes. For example, we can say there is a 1 in 100 chance that next year's flood will equal or exceed the 1-percent AEP flood. More recently, people talk about larger floods, such as the "500-year flood," as tolerance for risk is reduced and increased protection from flooding is desired. The "500-year flood" corresponds to an AEP of 0.2-percent, which means a flood of that size or greater has a 0.2-percent chance (or 1 in 500 chance) of occurring in a given year. How accurate are estimates of the 1-percent Annual Exceedance Probability (AEP) Flood (also known as the 100-year flood)? The accuracy of the 1-percent AEP flood varies depending on the amount of data available, the accuracy of those data, land-use changes in the river drainage area, climate cycles, and how well the data fits the statistical probability distribution. Most policy makers and water managers often are more concerned with the height of the water in the river (river levels) than the streamflow quantity. The uncertainty for the streamflow quantity of the 1-percent AEP flood for an example flood at the Big Piney River, Missouri can be translated into an uncertainty of the river level. A streamflow of 36,600 cubic feet per second (ft3/s) corresponds to a river level of 20.6 feet, whereas a streamflow of 56,400 ft3/s corresponds to a river level of 22.85 feet. Stated another way, the flood probability analysis reveals that we are 90-percent sure that the river elevation will be between 20.6 and 22.85 on the Big Piney River at Big Piney for the 1-percent AEP flood. The 1-percent AEP flood has a 1-percent chance of occurring in any given year; however, during the span of a 30-year mortgage, a home in the 1-percent AEP (100-year) floodplain has a 26-percent chance of being flooded at least once during those 30 years! The value of 26-percent is based on probability theory that accounts for each of the 30 years having a 1-percent chance of flooding. Can we have two 100-year floods close together? The "100-year flood" is an estimate of the long-term average recurrence interval, which does not mean that we really have 100 years between each flood of greater or equal magnitude. Floods happen irregularly. Consider the following: if we had 1,000 years of streamflow data, we would expect to see about 10 floods of equal or greater magnitude than the "100-year flood." These floods would not occur at 100 year intervals. In one part of the 1,000-year record it could be 15 or fewer years between "100-year floods," whereas in other parts, it could be 150 or more years between "100-year floods." This graph shows the incidence of the 10-year flood for the Embarras River at Ste. Marie, IL (03345500). The variability in time between "10-year floods" ranges from 4 to as many as 28 years between floods. It shows how irregularly floods have occurred during the past 98 years on the Embarras River near Ste. Marie, IL. The magnitude of the 10-year flood has been determined through statistical analysis to be approximately 31,100 cubic feet per second (ft3/s). You can see from the graph that the actual interval between floods greater than this magnitude ranged from 4 to 28 years, but the average of these intervals is about 10 years. Admittedly, use of such terms as the "100-year flood" can confuse or unintentionally mislead those unfamiliar with flood science. Because of the potential confusion, the U.S. Geological Survey, along with other agencies, is encouraging the use of the annual exceedance probability (AEP) terminology instead of the recurrence interval terminology. For example, one would discuss the "1-percent AEP flood" as opposed to the "100-year flood." The designation of the "100-year flood" was changed for my river recently—Why? The "100-year flood" of yesterday may not be the "100-year flood" of today. As the below charts show, changes in local land use, new river impoundments, changes in the amount of impervious surfaces, and long-term climate patterns can affect at what point a "100-year flood" is designated. Below are other science topics associated with flooding. The following topics provide background on some of the scientific issues regarding floods. A 100-year flood happened last year so it won't happen for another 99 years, right? Not exactly. Misinterpretation of terminology often leads to confusion about flood recurrence intervals. Read on to learn more. At places where the U.S. Geological Survey (USGS) does not have real-time monitoring equipment, we use high-water marks to measure the maximum height (stream stage) of a flood or high-water event. 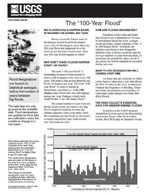 Significant Floods in the United States During the 20th century - USGS Measures a Century of Floods; 2000; FS; 024-00; Perry, Charles A.
Mason, Robert R.; Weiger, Benjamin A. 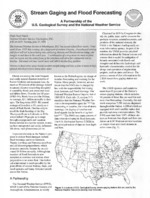 Stream Gaging and Flood Forecasting : A Partnership of the U.S. Geological Survey and the National Weather Service; 1995; FS; 209-95; Mason, Robert R.; Weiger, Benjamin A. Below are multimedia items associated with flooding. Below are FAQ associated with flooding.